So My Boy goes to the eye dr. yesterday. Per his pediatrician's referral. He flunked his 8 year checkup eye test. What irks me is that he took a school exam and I received nothing from them. DQ took the school exam, failed it and is now in glasses, did the examiner fall asleep during My Boy's exam? His Rx is stronger than big sister's. His teacher didn't mention anything. He didn't tell us he couldn't see. That field vision test where you click the button when you see a light flash....well there was a period of time (like 2 minutes) where there was no clicking done. Was it because his eyes were dilated?! Re-test next week. Hopefully we'll get everything taken care of and the strikeouts in baseball will cease. For the record, he did smack a homerun in Monday's practice game. Maybe he was squinting. It's a bit unnerving sitting in the room when your child looks up at the list of letters and says, "I don't see any of them, they're all blurry!" And it's the BIG LETTERS. So we're going to lay off the Nintendo DS for a while. We tease him about getting "googly eyes" for staring at that thing for so long, but now i'm wondering if has a negative effect. It was Spring Break, he wasn't too happy. But he ddi think those dilation glasses were cool. If you need me, I'll be researching eyewear investment opportunities. He looks handsome in his glasses. I know how it is. My boy never told us he was having problems seeing the board at school. Nothing from them either about him possibly having vision problems. Meh! You all will get it worked out and he'll be smacking homers out of the park every game. Chicks dig glasses! He's gonna be a total ladies man. MY DS got braces over Spring Break...poor kid! So cute!!! We just did that with Cooper. He went an entire 13 days before he broke them. We now have a plastic spare. Sorry! I asked the school nurse about that the other day and she assured me if there was a problem I would hear. Maybe I should follow up through my son's doctor (for hearing). He looks handsome. Tara need ed glasses too. She kept telling me she could not see the board, I figured it was the teacher's writing, we had just been to the eye doctor last Feb! It now makes sense that I would point something out to her in the distance and she could not see it. 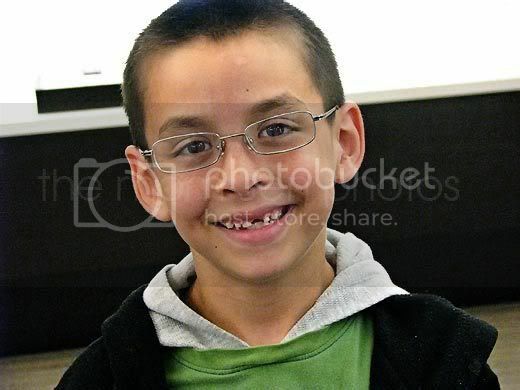 Ash had glasses from 1 yr to 4th grade. (far sighted) check up this yr after 2 years of not having them after surgery for lazy eye and corrective lenses, she's back in them for Near sight. WTH. Yeah, I didn't "notice" she couldn't see either. ooo that stinks you didn't hear anything from the school or he didn't say anything.. but how cute is he with his missing tooth and glasses! Adorable! He is handsome in his glasses! My 4 year old has been in glasses for 3 years, I think she's had 8 pair of glasses in this time, NO LIE!! Go figure. I don't know how these things go unnoticed. And kids just don't know. I remember when I got my first pair of glasses, and suddenly realized that trees had leaves that you could see. What is it with the school tests? Princess Nagger passed the school test, but when she had her 6 year check up, she was having trouble reading the line of letters she was supposed to read...so we have to make an appointment with an eye doctor to see if she might need glasses...she's kinda doomed because both hubby and I are near-sighted. Don't be too hard on the school. Kids at this age are growing so fast, he may not have HAD trouble seeing back in the fall when they did his vision screening. Eyeballs grow. Not always in proportion to the rest of the body. And often not proportionally. Which is why we get near/far sightedness. I had a kid who suddenly announced in TENTH GRADE that he couldn't see the board. He looks great in his glasses! My son loves his...AND his doctor actually "prescribed" more DS time to help strengthen his eye muscles! He looks great in his glasses!! My daughter has had hers over a year now and her eyes are actually improving! Good luck on your search! How could the screener have NOT noticed?! ARGH! Well, regarding prices on glasses I've heard good things about Costco. Have you looked into them? My husband tried local places but, regarding the recent tightening of the proverbial belt he found Costco to be a better deal. He looks really cute in those glasses! Yay on the hit in baseball... hope that getting new glasses will help his game, even better! He's looking good in those glasses! Both my husband and I wear contacts, so I look forward to many a pair of glasses for my kids!!! "It's a bit unnerving sitting in the room when your child looks up at the list of letters and says, "I don't see any of them, they're all blurry!" Yes, it is! But it doesn't mean you've done a thing wrong. Or even that you missed something you "shouldn't" have missed. He looks handsome! Tell him Superman wears classes-- so does Spiderman. I got glasses in 6th grade. I hated every minute of it and finally at age 34 got corrective surgery. My oldest son has glasses. I'll help him afford the surgery when he's grown too. Welcome to the club, little man!!! I have heard that Zenni Optical online has good prices and selection on glasses. Check them put, I have heard great things about them but have never ordered. Hubby & I are both 4 eyes so I think this is in our kids futures too. He sure does look good in them! How cute is he!! I love the glasses. And that smile ain't bad either. Sassy has 4 out of 30 kids in 1st grade with glasses. I was 12 when it was first discovered that I was blind. I couldn't read the board in school. So far, Bug has her dad's eyes - he's 42 and has 20/20 vision. I'm 34 and mine is 20/500. Yes, you read that right. Twenty five hundred. AKA blind as a bat. He looks adorable in his glasses! Our 8 yo is getting glasses next week. My dh thought something was wrong when they took a Spring Break trip and our son couldn't read the signs as well as my hubby thought he should. I wonder what he is going to look like. Aw. he looks adorable! i can totally see him rockin' some of those "transition lenses". That's what my niece has.